Abdominal ultrasound is available for patients to gain a different perspective of what’s going on in the body than x-rays offer. We are able to determine the architecture of organs such as the kidney, liver, spleen and bladder. 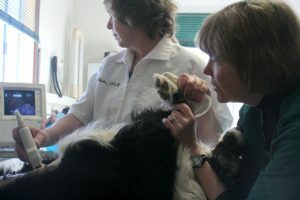 Additionally ultrasound can be used to diagnose pregnancies in small animals before a skeletal structure can be seen on x-ray. Ultrasound is also available on the large animal side for equine reproduction and lameness issues related to tendon injuries.